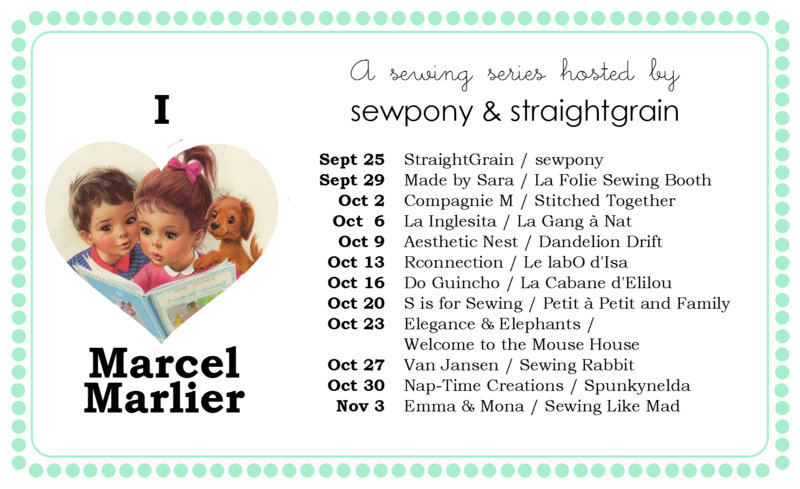 I am very excited today to show you my creations as part of our newly announced sewing series - I (heart) Marcel Marlier. I am opening the series today along with the very talented An from StraightGrain. You can read the introduction to the series here. Put simply, it is a series inspired by the beautiful illustrations of the late Marcel Marlier. I poured over Marlier's illustrations before settling on two dresses to inspire a dress each for my eldest daughters, Isabella and Juliette. 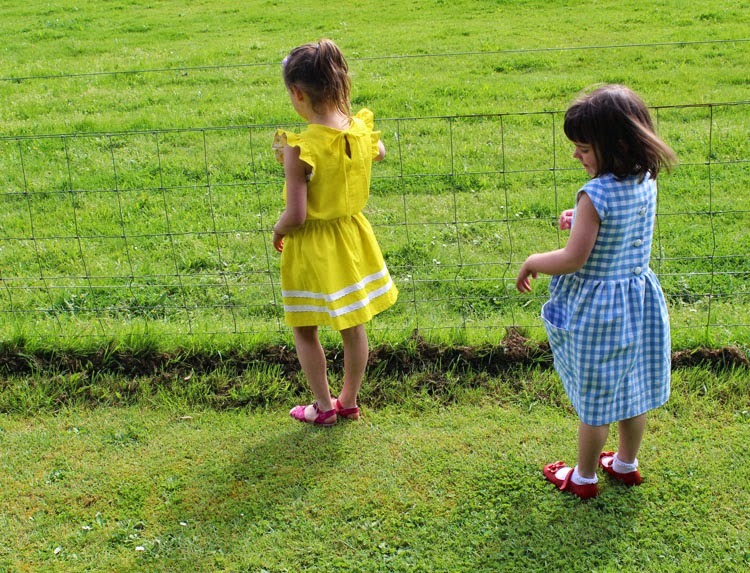 The yellow dress on the left and the blue striped dress in the picture on the right. 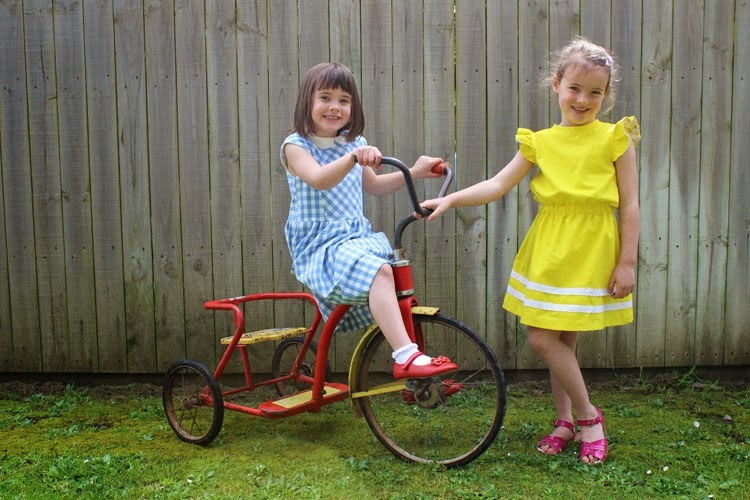 It was a lovely sunny morning, so Isabella and Juliette decided to go for a ride on their tricycle. 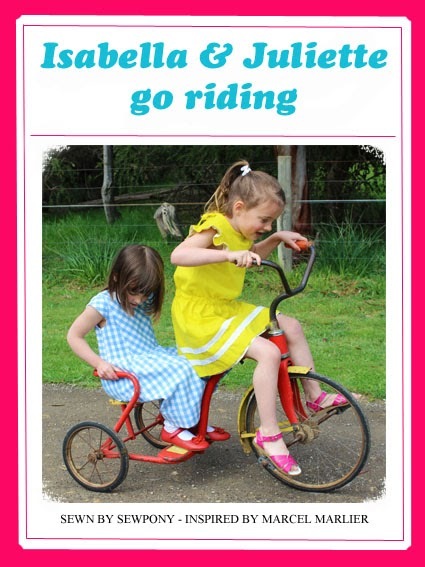 Isabella rode in front, while Juliette rode in the back. 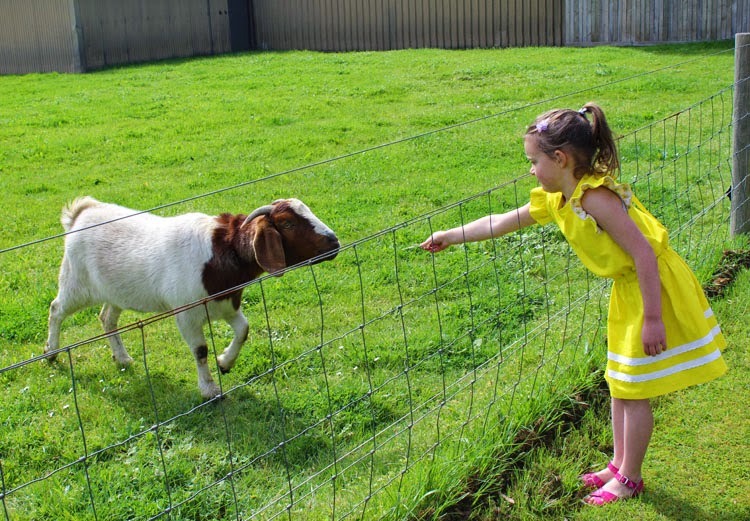 Isabella loved animals and the goats always came up to the fence when she came to say hello. They ate grass from her hand. Juliette came to see too. 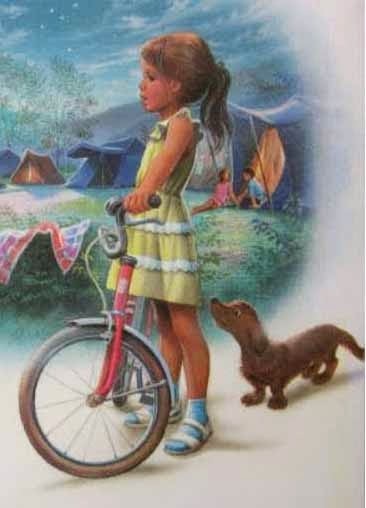 But she preferred to stay by the bike. She liked its shiny red paint. And she especially liked how it matched her shoes. Isabella said goodbye to the goat as it went back to its herd. Since Isabella's dress was reversible, she decided to change it up and turned her dress inside out. 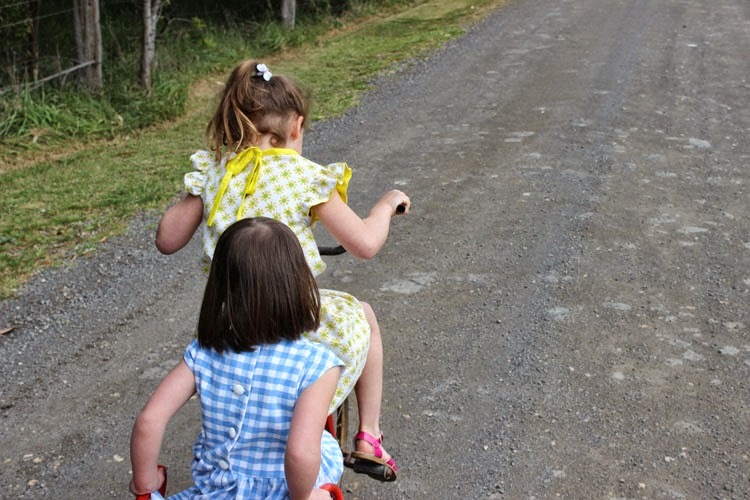 Then the girls road on to collect the mail from the letter box and headed back to their house. 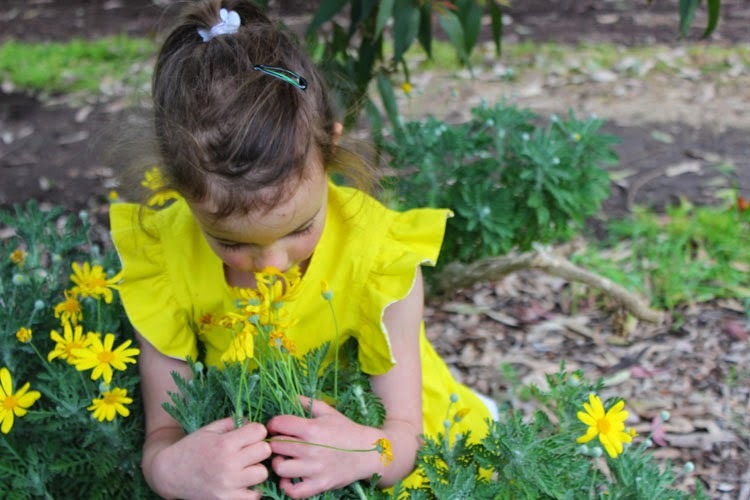 While Isabella paused to smell the daisies. 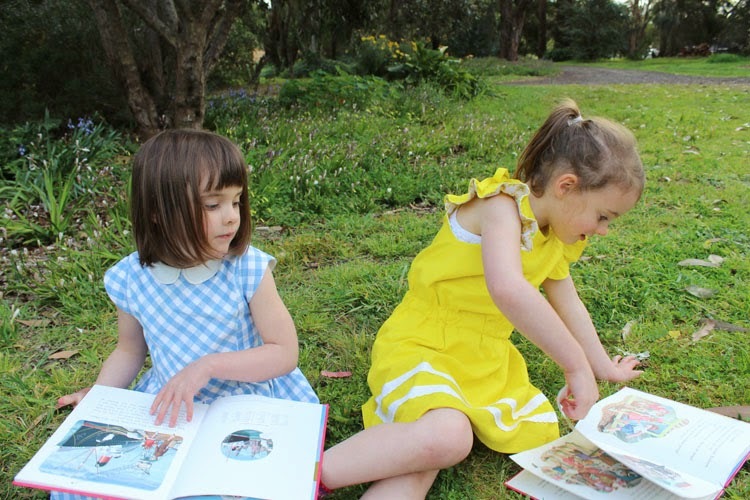 The girls ended their pleasant adventure by reading some of their favourite books together. but the sisters didn't mind that hey did not understand the words. They loved to make up their own stories by looking at the lovely pictures. 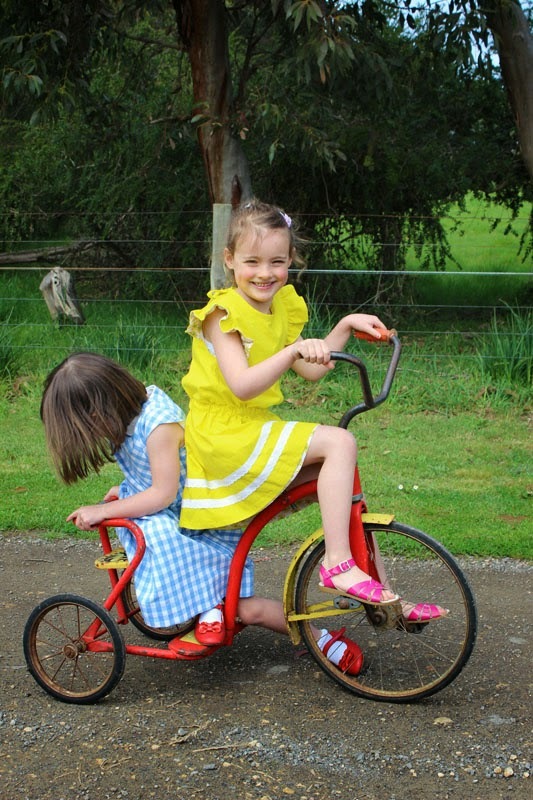 Just as Isabella and Juliette finished their stories they heard their mum call them in for dinner, so the tricycle was put away for another day. So now onto the dresses!! 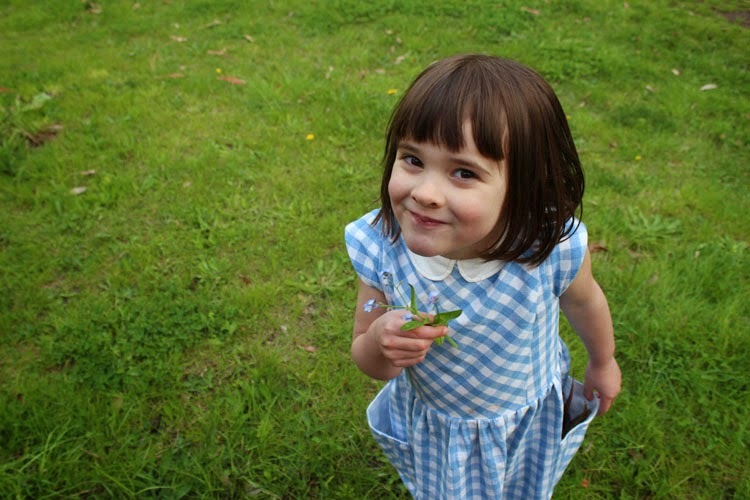 Isabella's dress: I drafted this dress myself. It is fully reversible and features flutter sleeves, a bias bound neckline with tie at the back and elasticised waist. 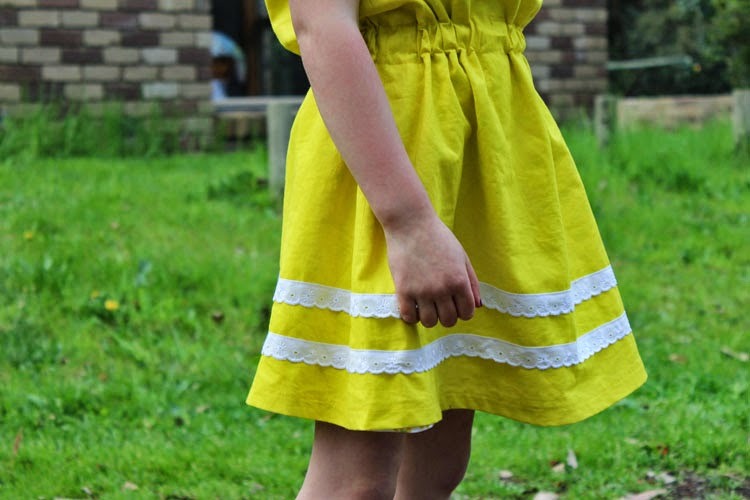 The yellow side features two rows of white eyelet lace trim. The yellow fabric is 'citrus' cotton couture solid from Pink Chalk Fabrics. Lovely and soft! The daisy fabric is vintage purchased from a thrift shop. Isabella wears fucshia saltwater sandals. 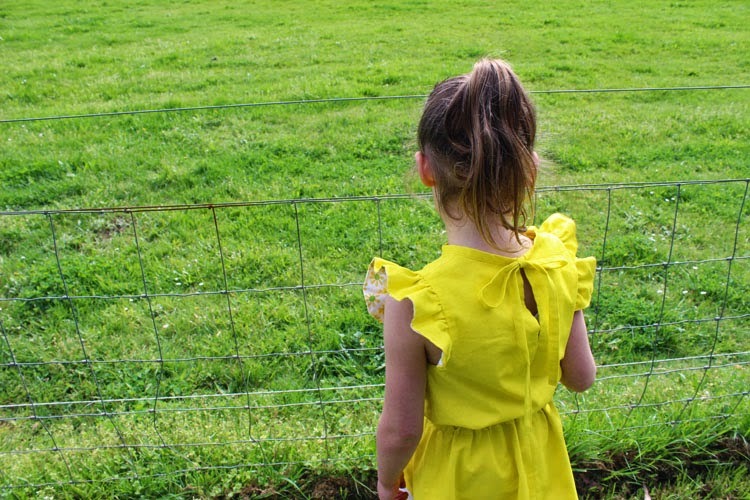 Juliette's dress: Also self drafted. It features a diagonally split bodice, half collar, small capped sleeves, buttoned back, gathered skirt with origami pockets. The dress is made from my late Grandma Mary's tabecloth!! It is a lovely weight and seems to be a cotton/linen blend. 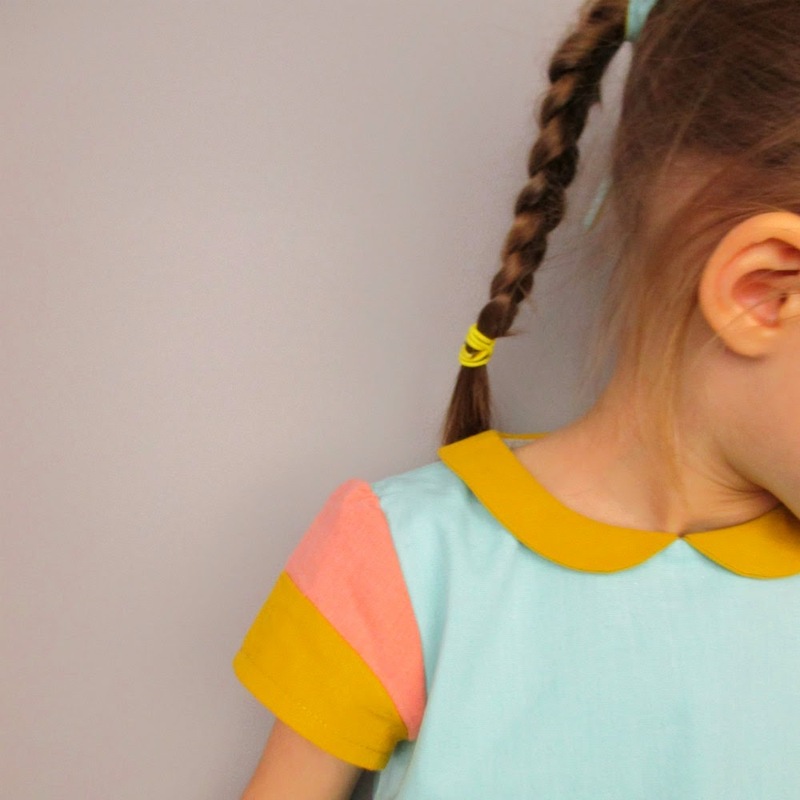 You may have read earlier today that An and I have an exciting giveaway to present to you, generously donated by Fat Quarter Shop and Pink Chalk Fabrics. Simply enter the widget below to be in the running to win one of these lovely prizes!! And now I can't wait to see what An has made. She sent me this picture as a teaser. Head over to StraightGrain to see!! 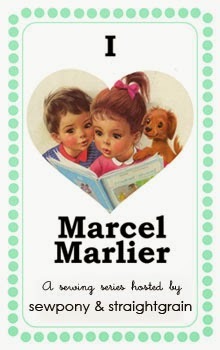 And please come back on Monday to see what Sara and Ines have made for I (heart) Marcel Marlier!! Ooh thank you Ines!! I can't wait to see what you have made!! 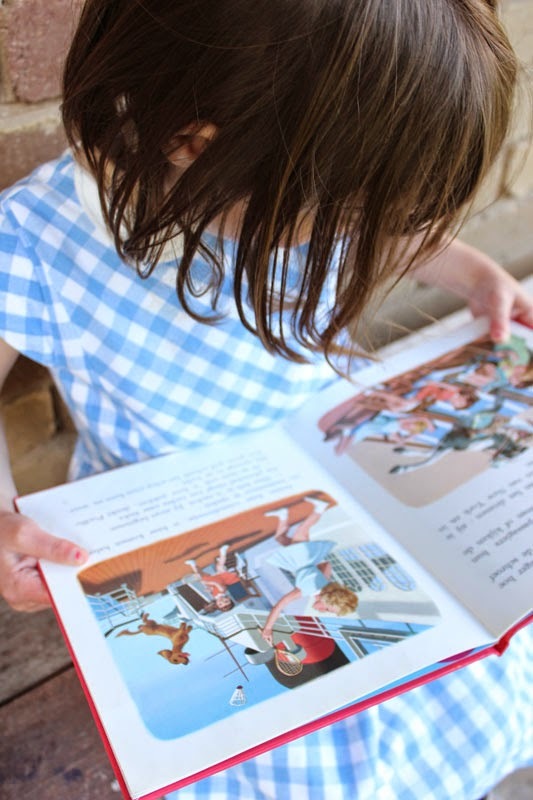 Suz, I love the story you've included along with your photos! I wish I'd known these books when I was growing up. Wonderful dresses Suz. Love Isabella's dress, so cute and girly! And I am absolutely in love with Juliette's dress. Love the lines, the collar, the pockets - the lot! These dresses are amazing! I would love for them to become patterns. 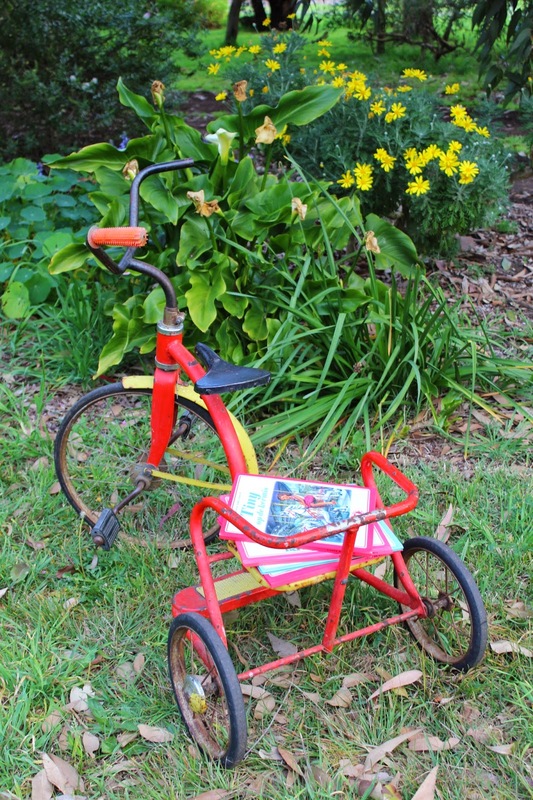 That tricycle is amazing too! Suz those two dresses are STUNNING. I so so SO love them both and that yellow color is basically perfect. Great job! Both dresses are so stunning, Suz! I love their vintage look, and the clear references to Tiny. Awesomeness. Love these dresses! The eyelet trim is so fun and the blue annd white one is so sweet. I loved the way to turned to photo shoot into a story. Great idea! What a lovely idea! Love these vintage dresses! 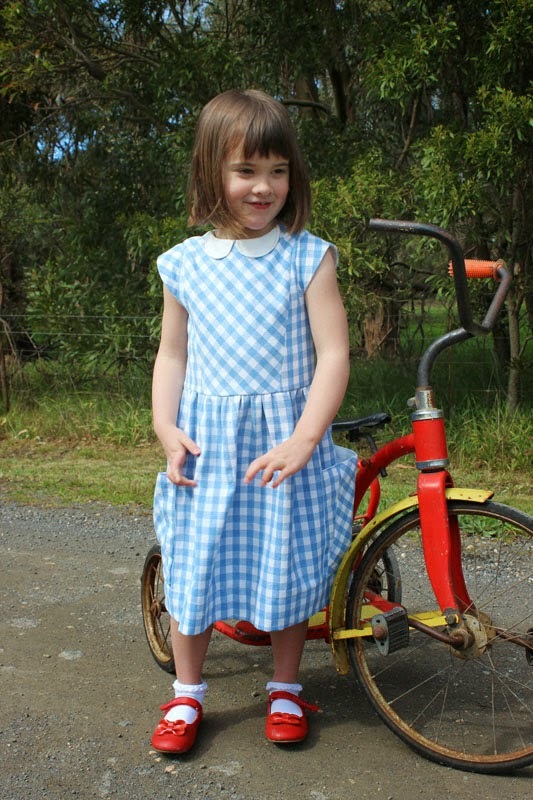 What a great job... Martine's dresses reminds me my childhood. 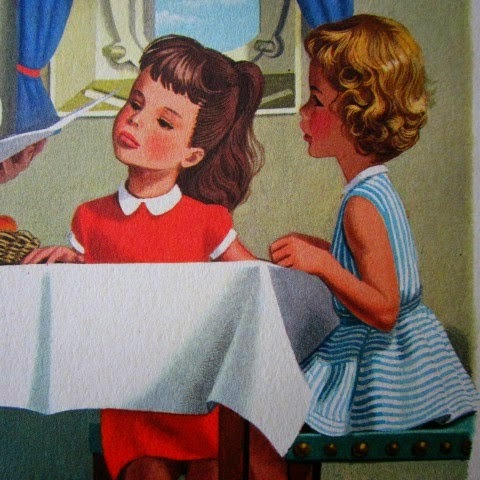 I read these books every evening for my girls... what a beautiful dresses you made! Can't wait for you to turn them into patterns !! No doubt your daughters could have been Martine's friends ;-)!!! Both dresses are such a beautiful tribute to Tiny books! These dresses are perfection! Such a great interpretation of M.M.. I love the narrative of your girls' adventures.